Okay, “The Band Wagon.” You need to know two things about this movie: One, that it is indeed “The Band Wagon” and not “The Bandwagon.” Getting it wrong is a rookie mistake and the true film snobs to whom you were so shabbily attempting to ingratiate yourself will see to it that you’ll never get into a Max Ophuls film festival in this town again. Secondly, that it is the single greatest musical ever made. We film snobs are a crafty lot and our predecessors produced “Singin’ In The Rain” just to smoke you fakers out. When we ask a newcomer “What’s the single greatest musical ever made?” we are trying to see if he or she actually watches movies. So many people are just there to stare at bright flashing lights for a couple of hours. “Singin’ In The Rain” — though a very pleasant movie — is two hours of bright, flashing lights. “The Band Wagon” is a movie. This song is a key case in point. Fred Astaire plays his age in a role that might have felt a little to close to real life for comfort. He plays Tony Hunter, an aging song-and-dance man. He’s a celebrity, but a nostalgic one; he’s a relic of the black-and-white top hat and tails-era of musicals and hasn’t made a decent picture in years. Today, Tony Hunter would be judging a TV reality dance competition. He takes a train from Hollywood back to New York to recharge his batteries. Upon arrival, he’s delighted and slightly relieved to find that the press has learned about his trip and is waiting for him at the platform. But after a minute or two of interviews they abruptly dash away; they were actually there to get photos of Ava Gardner, who is now stepping off the train. And then Fred Astaire strolls into the terminal, singing “By Myself.” It’s not a maudlin song about loneliness. Nor is it a brave anthem about independence and self-reliance. It’s a simple matter-of-fact acknowledgment. From Tony’s perspective, it’s more than how things are at that moment. It’s how things seem to be in general. That’s the difference between a great movie musical and one that’s merely Good. Is there any song in “Singin’ In The Rain” that does any heavy lifting? I’m replaying the flick in my head and I can’t think of a single on that reveals anything about the characters or advances the plot. The only songs in “The Band Wagon” that do nothing apart from sounding pretty are the ones in the show-within-the-show. So that’s settled, then: “The Band Wagon” is the greatest movie musical ever. Let’s hear no more of this “Singin’ In The Rain” nonsense. I do love this song. I hum it almost every time I’m walking through an airport, particularly during the walk to the baggage carousels at the end of my trip. The director of life, just as the director of that movie, uses that scene to underscore to the audience that this man is unattached. I walk past the little kids who drop their glittery “Welcome Home!” signs and run from the feet of one parent to the arms of the other one, who’s been away for far too long. I walk past the friends hugging. I step over the couple on the floor who really ought to show a little decorum, honestly. It’s the perfect situation in which to find yourself reflecting upon the status of being single. As in the movie, it’s not self-pitying; it’s just reality. For the record, when I visited a dear friend of mine last week, I was met at the train station and I immediately received a hug of true chiropractic intensity. When I looked for “By Myself,” I discovered that one of my favorite music boxed sets of all time had arrived in the MP3 Store. I did one of thos squealy things that a heterosexual man can only get away with if he works at home. 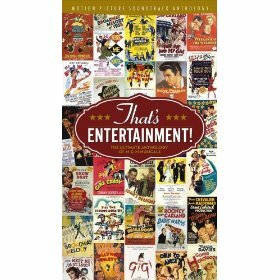 The “That’s Entertainment” set contains damned-near every fantastic piece of music from every great MGM musical ever made, ever. I bought it on CD years ago and I’ve re-ripped it at least three times, as encoding technology improved and the capacities of my iPods have expanded. As to the expense, it’s probably better if you don’t think about it. Just hold your thumb over the corner of the window where the price will appear and click “Buy It Now.” Look, it’s 132 tracks and they’re nearly all winners. As usual, I offer small penance by also including an iTunes Store link, from which I reap naught but the satisfaction of steering my readers towards an eminently diggable track.